Arizona State University has launched the first cohort of Quanta, a new online research program that harnesses social networking and e-learning to connect high school students with ASU students and scientists. Quanta is a massive, online, open research platform (MOOR) that serves as a portal into university research that gives any student the opportunity to engage with research and work with experienced mentors on topics they, themselves, are passionate about. The first stage of the program will run until Dec. 6, after which, the students will report on the processes and outcomes for their respective projects. Kathryn Scheckel, director of Quanta, started the program in the hopes that it would bolster creative problem-solving and foster student-driven research in Arizona – and eventually, spur a new movement in research nationally, where problems to grand challenges in research are crowdsourced from a passionate community of students. The program is geared toward passionate high school students, engaged researchers and university students as mentors. Approximately 250 students from three Arizona schools have signed up for the first cohort of Quanta, with 15 student mentors from ASU. Schools include the ASU Preparatory Academies from the downtown Phoenix and Polytechnic campuses, and the Center for Research in Engineering Science & Technology (CREST), within Paradise Valley High School. Projects are developed by professors at ASU, although eventually, students will be encouraged to submit suggestions about research they are currently working on or would like to work on in the future. DNA origami has broad implications in the future of nanotechnology, and students will be designing and testing the stability of different DNA structures and identifying ways to simplify them. “As a lab, we are thrilled to be getting involved in this pioneering program at the ground level,” said Hao Yan, professor and director of the new Center for Molecular Design and Biomimicry within ASU’s Biodesign Institute. “This online platform is an ideal way to get students from different demographics, backgrounds, educational levels and interests actively involved in a research environment. Yan is the primary investigator in one of Quanta’s original projects, where he and his students explore different models of nanoscale DNA structures. The “Documerica” project is focused on developing new ways to teach environmental history to high school and college students, as well as the general public. "Quanta provides an unprecedented opportunity: to broaden research teams and open the research process to include a wider diversity of participants, and to help develop students into critical thinkers and world citizens ready to solve the problems of the future,” said Cody Ferguson, postdoctoral scholar in Environmental and Public Humanities, ASU School of Historical, Philosophical, and Religious Studies. Ferguson is the primary investigator for the "Documerica" Quanta’s project, where he and his students use “Documerica” photographs to examine environmental change in the United States over the past four decades. “Digital Culture Creative Classrooms” introduces high school students to the ideas, tools and technologies involved in computational creativity and digital culture. Tinapple is leading this Quanta project. The Digital Culture program's goal is to bring the proficiency-based curriculum designed for undergraduates to middle and high school classrooms. The goal of Quanta is to expand student enrollment for the spring phase and deepen the program’s reach beyond Arizona. High school students from every region are encouraged to apply. The next cohort of the project will begin in January 2014; applications for Quanta will become available in late November of this year. For more information, visit quanta.asu.edu. 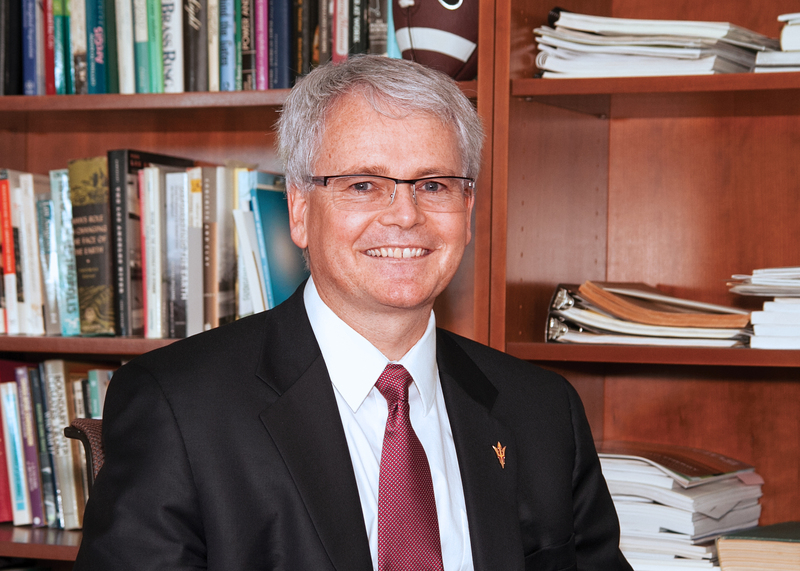 ASU professor Christopher Boone has been named dean of the School of Sustainability. Christopher Boone, professor at Arizona State University’s Schools of Sustainability and Human Evolution and Social Change, has been named dean of the School of Sustainability (SOS). Boone joined ASU in January 2006 as an associate professor and gained full professorship in April 2010. He is a co-principal investigator for the urban Long Term Ecological Research projects based in Baltimore and Phoenix, supported by the National Science Foundation. In addition to his academic pursuits, Boone is a member of the executive committee of the Global Institute of Sustainability. He also serves on the Mayo Clinic Green Committee and was recently elected to the Executive Committee of the Council of Environmental Deans and Directors for the National Council on Science and the Environment. Gary Dirks, director of the Global Institute of Sustainability, said that he is pleased with Boone’s appointment. Rob Melnick, executive director and chief operating officer of the institute, added, "Chris Boone is an exemplary sustainability scientist and a modern scholar who has embraced a transdiciplinary approach in his teaching and for developing solutions to local, national and global challenges of sustainability. As a founding faculty member in the School of Sustainability and as one of the primary architects of ASU's Global Institute of Sustainability, Chris will be an outstanding educator-leader for extending the school's already excellent reputation." Boone, who in 2009 headed a provost’s committee to develop a minor in sustainability, is a member of the scientific steering committee of the Urbanization and Global Environment Change program and has participated in the U.S. Global Change Research Program’s National Climate Assessment for Cities. He also actively contributes to Future Earth, an international research initiative that aims to transform the risks and opportunities of global environment change into sustainable outcomes. Boone has co-authored two books on urban sustainability, “City and Environment” and “Urbanization and Sustainability.” He currently serves on the editorial boards of journals such as International Journal of Sustainable Urban Development and Environmental Justice. He is also the associate editor of the journal Current Research on Cities and co-editor of a new book series, called "New Directions in Sustainability and Society." Boone received his graduate and doctoral degrees in geography at the University of Toronto before pursuing a post-doctoral fellowship at McGill University in Montreal, Canada.